Tanya Vogel announced today she will depart from the women’s soccer program after 12 years as its head coach and transition into an administrative role at the University. Vogel’s news comes on the heels of the completion of the 2011 women’s soccer season, where her team posted a 5-12-2 overall record, failing to qualify for the A-10 tournament. Her move will open another coaching vacancy in the GW soccer programs, already seeking a replacement for retiring men’s soccer head coach George Lidster. She took the reins of the Colonials in January 2000, hired to a program that won just three games during the 1999 series. She’s posted 82 victories while at the helm of the team, including back-to-back 10-plus win seasons in 2002 and 2003. 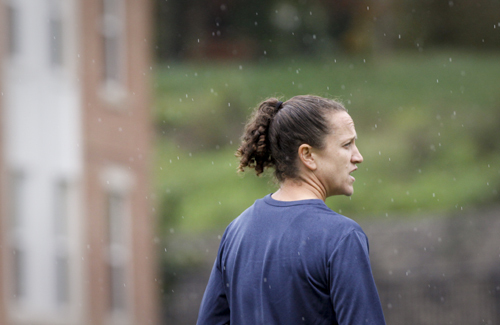 During her tenure as head coach, Vogel mentored 12 all-conference performers, and saw the team win its first GW Women’s Team Academic Excellence Award and earn recognition from the NSCAA with the College Team Academic Award in 2010. Vogel also competed for the Colonials for four years, and was a member of the school’s most successful season in 1996, when the GW earned a bid to the NCAA Tournament, and served as team captain her junior and senior seasons. Vogel ranks sixth all-time at GW in scoring with 52 points, and was the Atlantic 10 Player of the Year and named to the Atlantic 10 All-Conference First Team in 1996. Vogel became the first women’s soccer player to be inducted into the GW Athletics Hall of Fame in 2002. She holds a bachelor’s and master’s degree in exercise and sports science from GW, and completed her MBA at GW in 2006. Vogel recently completed a four-year term on the NCAA Division I Women’s Soccer Committee, chairing the NCAA Women’s Soccer Mid-Atlantic Regional Advisory Committee. She continues to volunteer with young soccer players in the D.C. area, volunteering at camps and clinics and coaching four Bethesda Academy U-10 girls’ teams.